Need to track down your child PC activities on the internet, actions performed by your employees on the computer system or to monitor the overall PC usage. Advance KeyLogger Software is a complete solution that helps you to track and record the entire computer activities including all system and internet activities and other similar computer applications. 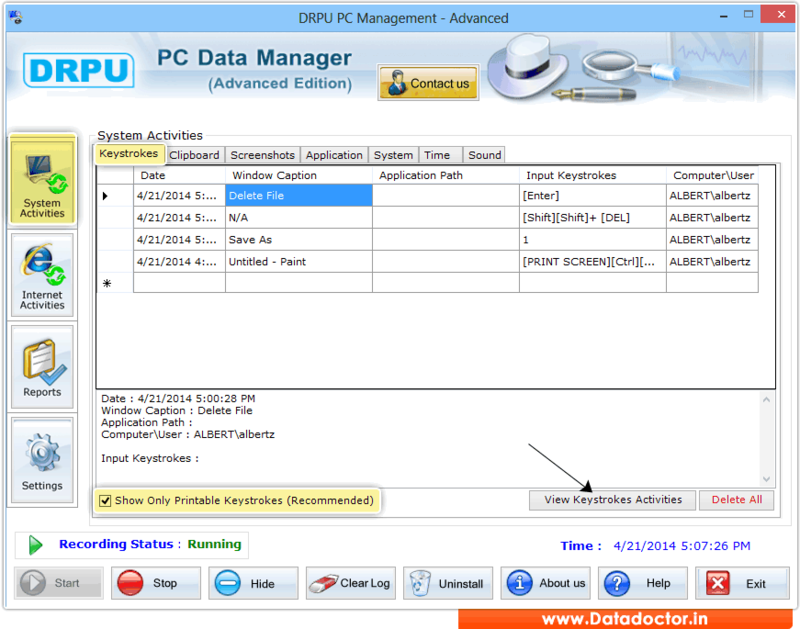 PC surveillance utility monitors active windows applications, browsed web pages, emails, chat sessions and captures windows screenshots at regular interval of time. Software records browsed web pages, clipboard activities and all typed keystrokes including language-specific character, Talk and Message conversation, Typed Documents etc. Software even records any modification altered in computer startup time and various changes made in system date/time by any user on your PC. Hidden Key logger surveillance tool can even work in stealth mode and remains undetectable in Add/Remove program list, Start Menu, Program Files, thus provides no visual proof of software running. Easy to understand utility saves every typed activities in encrypted log files and secretly sends saved report to your e-mail address or upload text log using FTP server settings as per defined by you. Computer monitoring utility is very useful to monitor the PC activities of employees during office hours and internet activities of children while you are away from Home. » Records entire system activities such as Keystroke typed, Clipboard entries, Screenshots, Windows applications, System information, Changes made in system date and time, Sound Clips etc. » Records overall internet activities suh as Online Audio chat conversations, Website visited, Composed and send emails, Internet cookies, Temporary files. » Provides option to secretly monitor the computer activities in stealth mode. » Password protected utility prevents unauthorized users to change or modify software configuration settings. » Generate the log report in Text or Html file formats. » Delivers the log report via email or using FTP server.